This layout was so much fun to put together! The photos are of my daughter pulling clothes out of the laundry basket. For some reason, she loves laundry. Whether it's dirty or clean! The papers that make up the little squares (and the majority of embellishments) are from American Crafts' Dear Lizzy Neapolitan collection. 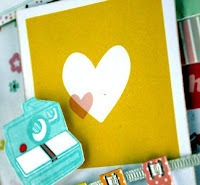 The 'wooden' background paper is from Echo Park's This and That - Charming collection. I think it goes so well with the theme and feel of this layout! The border with the numbers is also from that collection. The scallop edges on the side were punched from white card stock using the Martha Stewart Scallop Dot punch. I wanted this layout to have somewhat of a 'laundry feel' to it which is where the clothespins, twine, and buttons came in. The wooden buttons, pennant flutterbys, and pink Thickers are also by American Crafts. The colorful buttons are from October Afternoon's Sidewalk Chalk collection. I fussy cut the tiny Polaroid camera from an Echo Park's Playground collection paper. The word 'love' is spelled out using alpha stickers from Simple Stories' Fabulous collection. Happy Friday! Don't forget - COLOR ME SCRAPPY goes live THIS SUNDAY! Make sure you become a follower so you can participate in our very first challenge. I hope everyone has a great weekend. Toodles! this is sooo cute! love the clothes pins! This turned out so cute and it's great that you are documenting her stories now because as she gets older I'm sure she will still throw clothes all over but it won't be the same as she will be trying to find the perfect outfit to wear. That turned out super cute! TFS! Such a fun page!! Love the laundry feel of all the embellishments! Christina - your page is absolutely adorable! This is such a fun, cute layout. 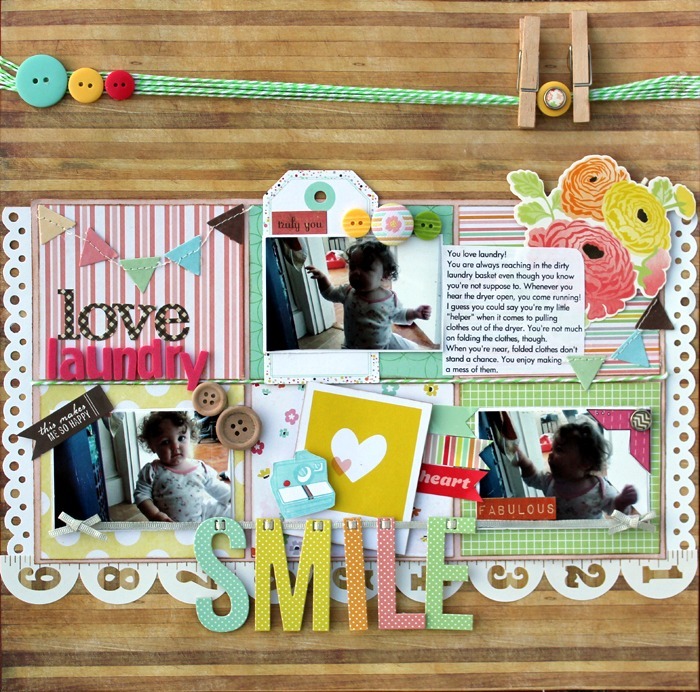 Very cute and fun layout! Great job.